This anonymous First World War Victory Bond poster depicts a Canadian soldier who pointedly asks members of the public to buy war bonds in support of the war effort. The design was loosely based on a First World War United States recruiting poster featuring a pointing "Uncle Sam." This has proven to be America's best-known poster ever and has been reproduced in the millions. 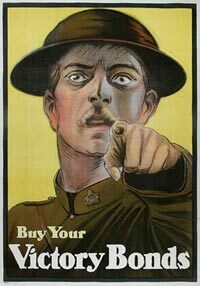 Its original inspiration, in turn, was the celebrated 1914 image of Lord Kitchener exhorting Britons to join the British Army, also the most successful First World War recruiting poster the British government produced. Small wonder then, that the Canadian government also put the imagery to good use.